Our platform is super-fast and easy to navigate. It consistently loads pages in 0.2 seconds on average, regardless of the number of products offered on the site. It grows as you grow. Many supermarket ecommerce platforms experience a severe slowdown as they add more products to the mix. Why do we pay such close attention to a small detail like load time? According to Google, even a fraction of a second shaved off load time tends to boost customer confidence and trust in your site, and sow the seeds that will make them tell others about you. Your customers are looking for creative ideas to keep their meals fun. Now they can find a recipe, click the “Shop by Recipe” button, and send ingredients to their shopping cart. They will also complete their shopping list much faster when they start with a pre-populated list of the products they normally buy, or by quickly sending all the items from their previous order directly to their shopping cart. With our platform it’s that easy! And, of course, we will keep your customers constantly engaged by sending them interactive digital circulars on your behalf! We implement an integrated uber system, so your online supermarket software functions effortlessly with your existing back office and your POS computer systems. And we handle ongoing technical activities like upfront product imports as well as regular updates to products, prices and stocked quantities. We take care of ecommerce, so you can take care of business. We routinely monitor, maintain and upgrade the software for your online store, to make sure you continue to enjoy a state-of-the-art system with the latest updates as well as all new releases. The smallest details are important when it comes to food photography. We use only professional, high-resolution images that your customers can almost smell and taste. We establish long-term relationships with our clients. We’re not a vendor. We’re a valued partner. 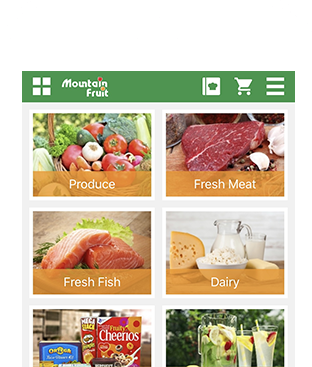 You’ll always have full access to our deep industry expertise in the grocery and supermarket business, especially the online space. We’ll guide you hand-in-hand throughout the process as we work together to advance your business. We design your website to embody your brand and to reflect your business processes. Good design leaves an indelible impression on customers, and helps you quickly and accurately fulfill their orders. Good custom design will pay big dividends for your business. Your online store is always open for business, because it’s hosted in a secure data center that’s state-of-the-art. You’ll never have to worry about data backup, disaster recovery, or security monitoring. We’ve got you covered. We are fully compliant with PCI requirements. Our skillfully engineered fulfillment and delivery modules ensure that your customers’ orders are fulfilled and delivered quickly and efficiently, maintaining customer satisfaction. And happy customers are loyal customers. The improved in-store process efficiencies save you time and money. Our platform’s back-end is fully equipped with powerful ecommerce reporting and analytics. These tools provide you with valuable intelligence to excel in marketing and fine tuning your business. We have compiled valuable information into a single source document to help supermarket executives evaluate their options in the digital space, and formulate their strategies. 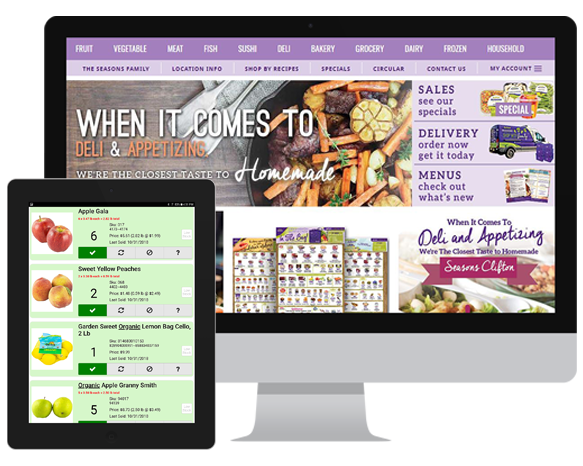 Are you looking to launch your brick-and-mortar supermarket into the digital grocery space? Do you need to update your existing eCommerce platform? We’d love to partner with you. Call 718-480-5000 to schedule a live demo, or send us a message using this form.